You will be greeted by our experienced local tour guide at 4.00pm at your hotel’s lobby then he walks you to our vantage Masthead Car that was invented in 1902 in United Kingdom and it is the only unique model in Cambodia, which nowadays is served for tourists to explore the surrounding of Siem Reap and the ancient city of Angkor Complex. In a slow pace through the Siem Reap city highlights when the evening is fading, the Masthead car truly gives much interaction and a bit of more fun from all the way toward Srah Srang (or The Royal Bath) – one of Cambodia’s water reservoirs was built in the ancient time of Angkor by Khmer King. Our tour will provide this incredible Angkor history and the insightful background before we start to open the sunset pack. 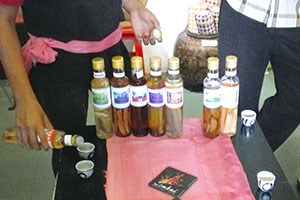 Enjoy sipping the taste of selected family wine (or choose local Angkor beer instead) followed by homemade finger snacks, kaffir-lime leaves with peanuts, camembert and black olives while seeing the sunset-colors fading over the Angkor jungle. Tranquilly have the rest of your free evening and take some amazing photos then we’re heading back to your hotel. 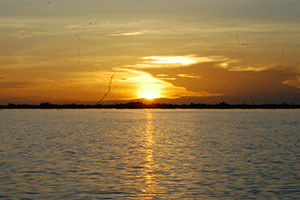 Note: You won’t definitely see the sunset at Srah Srang because the area is surrounded by the forest. If you don’t want to spend a valid Angkor pass on this day, the free entrance is allowed after 5.00pm and that means we will manage the time for you but by the time we arrive at Srah Srang, it will shorten your time if the twilight fades early (depends on season of the year). 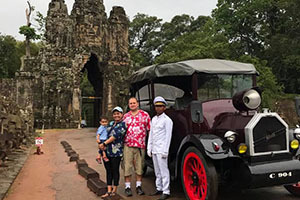 You will be greeted by our experienced local tour guide at 4.30pm at your hotel’s lobby then he walks you to our vantage Masthead Car that was invented in 1902 in United Kingdom and it is the only unique model in Cambodia, which nowadays is served for tourists to explore the surrounding of Siem Reap and the ancient city of Angkor Complex. 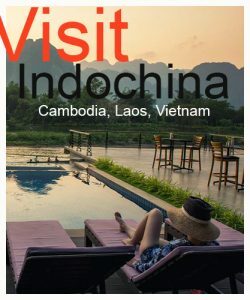 The journey begins with Siem Reap city highlights, The Masthead gently slides to one of Cambodia’s beautiful countryside that locates about 5km from central town of Siem Reap. Rolling over zigzag path of Chreav village dotting with coconut & palm trees, you definitely come across authentic rural activities in vegetable gardens, rice fields, see animals including cows and water buffaloes especially you’re warmly welcomed by kids with loud words “Hello”. The Masthead cruises and parks into a pleasant area where we’re going to watch the spectacular sunset fading at horizon while we’re sipping the wine selection (or Angkor beer) followed by our creative finger snacks. Valid Angkor ticket if you choose Srah Srang and go through the ticket booth before 5.00pm.